For some, shopping is a hobby. For others, it’s a chore. Love it or hate it, we have to shop. Purchasing partisans and retail recluses alike—we all need food, clothes, and home supplies. At least these days the methods for getting that hobby or chore done are ever-growing. You can still enjoy a leisurely stroll down every aisle, sipping hot coffee to retro pop music. But now you can also literally upgrade your entire wardrobe or fully stock your pantry while you wait for that casserole to finish baking. With the change in shopping options comes a new hot debate for those who don’t want to blow their budget in the store or online. Shopping at the Store or Online: Which Is Best? Yeah, there’s no straightforward answer. Sorry to disappoint, folks. But what we can do is provide some insight on how to save with either method! When it comes to deciding whether to shop online or in the store, we consider two basic things: What are we buying and how does our budget come into play? If you want to save money, you really can’t go wrong ordering your groceries online and picking them up at the store. Why? You’ve already heard you shouldn’t shop hungry. But when you’re physically in the grocery store, hungry or not, your five senses can temp you into overspending. The tiny pictures online aren’t as tantalizing, so you can keep your head in the game by finding an affordable store with a free pickup program. And what about deliver-to-your-door options? Just shop smart here. Maybe the item is on sale, but the shipping cancels that out. Never forget the power of coupons even when shopping online. You can do some virtual clipping to conserve even more cash. When grocery shopping online, view the price of each item before placing it in your cart and make note of the total before checking out. You’ll avoid impulse buys and save time. And as we all know, time is money. Some people are pretty picky about their produce. If you buy online, you can’t thump that melon or squeeze your avocado. You also can’t pick the cut of meat you prefer. A can of beans may be a can of beans, but fresh food looks different in person. Also, your online options will be limited. You can look through more brand and flavor options for your milk and yogurt in a store. Don’t forget that many stores have online couponing too. You can save them to an account linked to your phone number and watch the grocery total diminish at the register! And those in-store deals don’t always work when shopping online. Check out the weekly ad to make the best shopping choices for your grocery budget. If you have young children, consider buying the majority of their clothes online. You can take advantage of big sales and steer clear of dressing room drama. 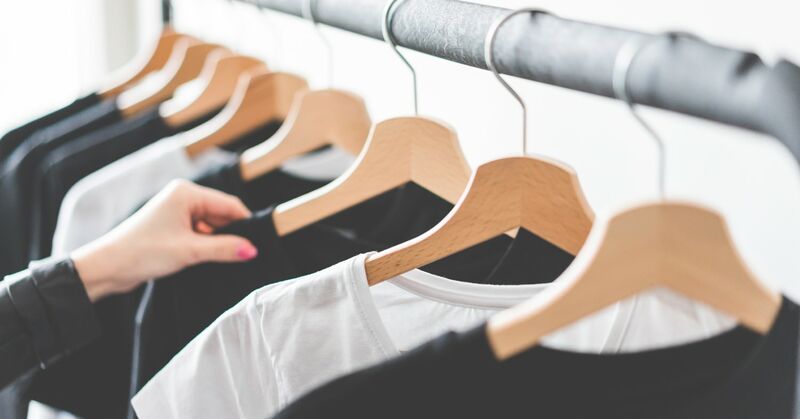 Once you know which stores and brands fit them best, you can watch for online sales before you stock up on what they need for the next season—or when they outgrow those pants after wearing them only twice. What about you? For those of us often on the go, getting into an actual store, looking through rack after rack, and trying on piece after piece might seem like more work than it’s worth. Buying your clothing online gives you the opportunity to try on in your own home on your own time. Since a physical store is only so large, sizing and style options can be so much larger online. Plus—and this is the best part for budget-minded buyers—if you sign up for emails from your favorite clothing stores, you’ll be notified when they have huge online sales. And we mean HUGE. If you’re willing to wait (and you should be! ), those pants that were full price last week could be 50% off, and an extra 30% off that, today! Waiting. Waiting. Waiting. Even with the explosion of the two-day shipping option, nothing gets your new clothes to you faster than buying them in a physical store and walking out the doors with them. Right then. Plus, if you buy online, get the wrong size, and have to return and repurchase, you just lost even more time you could be enjoying in your new duds. When you buy online, you may have to return to the store or pay for the return postage. Make sure you’re always aware of return policies! If you buy in a store, you won’t be running to the post office or waiting for the money to return to your bank account days after the warehouse receives your return. If shopping online provides choices, shopping in the store provides clarity. The item fits, you like the fabric, the color isn’t different than the picture . . . in person purchases have way less unpredictability. Emails, weekly ads, online ads: watch for sales and coupons! You can save money and the back and forth of returning packages when you go to the actual store. Home supplies range from toilet paper to toiletries. Use the internet to your advantage here. For basic items, an Amazon Prime membership often provides free two-day delivery and the lowest cost, plus coupons with discounts applied at checkout! Buying home supplies online offers an incredible chance to easily compare prices. You can visit 10 stores online in the time it would take you to drive to one. The convenience of buying toilet paper in bulk the moment you realize you’re running low is a beautiful thing. Just make sure you aren’t overpaying each month for that convenience. Once again, store promotions, coupons, and sales often apply to things you buy in the actual store only. Of course! That’s how they get you in the building to then buy all the things you didn’t plan to! But for a shopper with a plan, you may want to keep going in and getting deals. For some of your not-so-basic home supplies—like electronics or appliances—do a little research before purchasing. You may decide to visit the store and talk to a human being, but looking online first enables you to walk in prepared. Researching online and then buying in the store is always a smart way to go. Plus, in a store you can sometimes purchase scratch-and-dent or floor models at a discount. If the back of that fridge has a scratch, no one will ever know anyway! You can find great, affordable art online at sites like Etsy, Society 6, and Jenny’s Print Shop. It’s like exploring craft shows from your couch. With the popularity of small-business, internet-based shops, you have access to so much more—without having to pay for gas to get you to that favorite hand-lettering pro in Boston. When you find an online shop you love, follow them on social media. You’ll be alerted to any promotions or sales they offer throughout the year! If you love the thrill of the shopping hunt, you can save big by starting your search locally at TJ Maxx, Homegoods, Target, or the like. Even your local flea market, antique stores, bargain centers, and consignment shops offer good deals and an activity for your Saturday off! Some people really need to see an item in person before knowing if it will work in a space. These people will do better buying in person. When you walk into a store, you might spend more than you planned. A quick trip for new socks can turn into a splurge on a bag of candy as reward for adulting and buying boring new socks. Oh, and maybe you need new shoes to go with the socks. When shopping online, you don’t have to plan a day around shopping. Nearly anything you want is truly at your fingertips. This is incredible . . . and incredibly tempting to spenders. Sometimes the fantastic internet world feels just unreal enough that those purchases don’t have the proper realistic impact. You can spend, spend, spend without realizing it. No matter where you find yourself on your next shopping spree—on the couch or down the aisle—make sure you’ve got the most important shopping list of all by your side: the budget. With a monthly budget, you give yourself permission to spend. That means you can shop without guilt and worry, knowing that today’s spree won’t derail tomorrow’s plans. EveryDollar helps users create that list—and fast! In just minutes a month, anyone can make a plan for their money and how they’ll spend it. What’s more: you can track your spending along the way, making sure you never go you’re your budget. As soon as you check out—with that real or virtual cart—add the transaction so you stay on track. Or upgrade to EveryDollar Plus. When your purchases show up, all you have to do is swipe them into the right budget line.